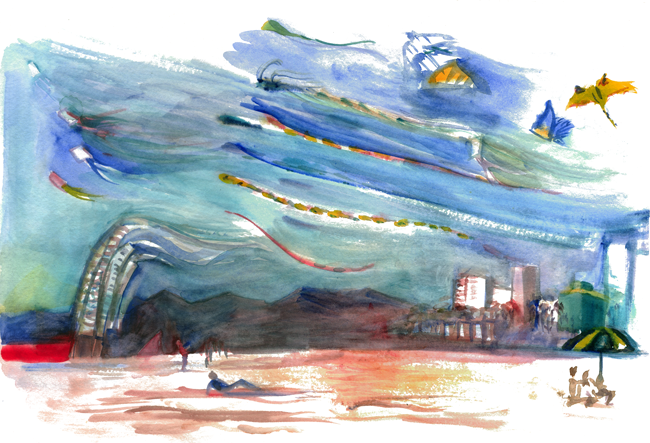 The beach by Santa Monica Pier was transformed by colorful kites puncturing the usually flat blue of the sky this weekend when Kite Festival sponsored by Otis College took place. I used a mix of wet and dry brush strokes in the sky to show movement. Otis College provided small white square kites that people decorated, and those kites happened to fly among big kites set up by a corporate event next to them. I haven't flown a kite since I was a kid myself, so it was fun to see kids flying kites with help from their parents.